This is the first complete work on the life of Bach ever written for children. Every important incident is mentioned and every detail of the story is true. 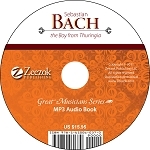 It is filled with vivid descriptions of Bach’s childhood and adult life. The music reproduced represents all the kinds of music that Bach wrote. A child can never really know music unless he knows Bach, for his contribution is the foundation and structural basis of all music. But it is more the human side of this book that will make it live, for in it the great master breathes. Q: Can the music be played from this ebook or is it simply the written sheet music that is included? I am trying to decide between the ebook and the audio book. A: The eBook only includes the sheet music. It does not play the music. The audio book does include the music being played.